You may be looking for the drive-away awnings called Country Road, Ocean Road or even one of the older models California Highway or Hollywood Freeway? All of these will soon be gone from our website because Outwell's product development team has come up with a complete new collection of drive-away awnings for the 2018 camping season. The new tents will replace all older models. The new product collection of Outwell's drive-away awnings includes tunnel tents and dome tents in 2018, too. All tents are aligned with the bus to have the front opening parallel to the camping bus's side door. All tunnel tents of the 2018 season bear the name Scenic Road, they resemble the Country Road models of 2017. 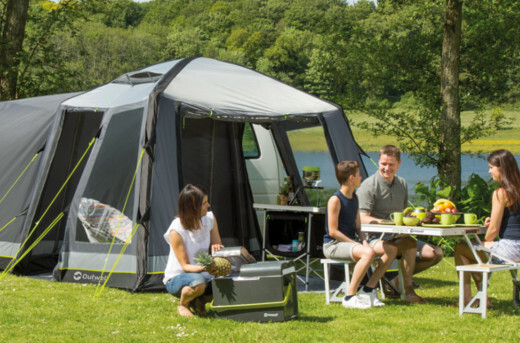 The dome tents series is called Milestone, which compare to the Daytona tents of 2017. If you are looking for an inflatable drive-away awning, watch out for all models with an Air or SA (Smart Air) suffix. The SA models have advanced air tube system where all tubes are connected so there is only a single inlet valve. With the Air models, where each air tube has its own valve, the pitching is done a lot faster than with poles. When you travel to areas with big temperature swings, a tent with a common pole system could be the better choice. Temperature swings make for changes in the air pressure, which has an impact on the air tubes, too. They lose some of their stability until you check the pressure again and maybe refill the tubes. The new collection includes a few drive-away awnings that are really made to drive away anytime: Instead of a constant connection to your bus (Link Access Zone) they have a canopy on the side that is directed at the bus. The models Milestone Pace and Milestone Pace Air are not connected to your vehicle. So you can leave the tent at the camping lot and go for a tour by car - no need to unthread any connectors. The canopy serves as a rain shelter for the space between car and tent. The drive-away awnings with a sophisticated connection - Milestone, Milestone Air, Milestone Pro, Milestone Pro Air, as well as all models of the series Scenic Road and Scenic Road SA - make sure that you can safely step from your camping bus into the tent without any rain, wind or dew to bother you. The groundsheet is made in a way to keep out draughts, too. This Link Access Zone is about 80 to 90 cm deep and has sidedoors to both sides, so you can get out of the car without the need to walk through the drive-away awning. Outside, enjoying the fresh air and taking a deep breath - that's exactly what we love about camping. In the new drive-away awnings by Outwell you can do that even indoors, thanks to completely opened front and rear sides. The tents Milestone Pro Air, Milestone Pace Air, Milestone Pro, Milestone Pace and all Scenic Road and Scenic Road SA models can be zipped open on the whole rear side. The way from tent to bus is then completely unobstructed. Fresh air comes in via the front side when you pull the zippers here too. To make sure that nature does not come too close, an insect-proof mesh shields you from buzzing and biting guests that would interfere with your relaxation. 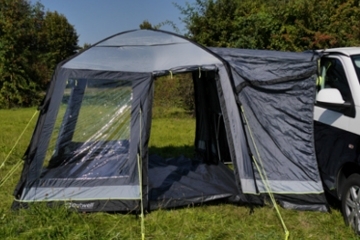 The tents Milestone Air and Milestone have grand doors at the front and back, so you can air these awnings too. They also have the insect-proof mesh at the front side. However, a complete opening of the whole side is not possible here. 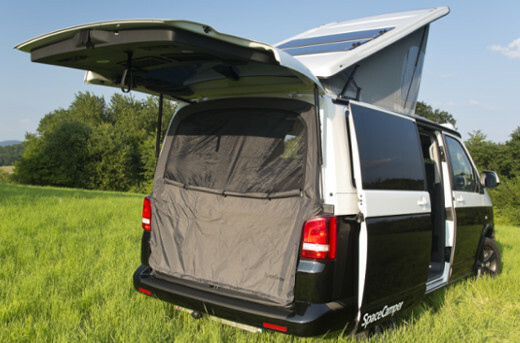 For those who like to have the curtains just as high as necessary to prevent the sun from blinding you, the new curtains will be the new favourite feature: The drive-away awning series Scenic Road and Scenic Road SA have zip-up curtains, which allow for a steplessly variable control of light incidence. All Milestone tents have curtains with fixed steps to open the curtains, completely, half or not at all. The Cruising Canopy, introduced in 2017, was a big success. 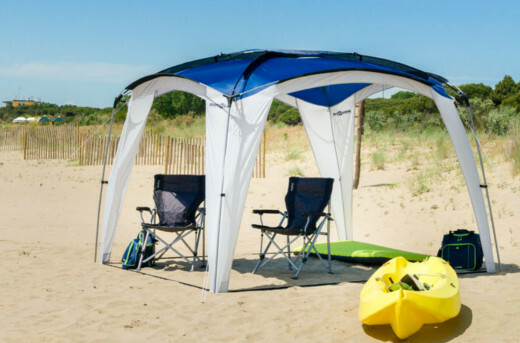 So in 2018, Outwell takes a step further and turns it into a whole Touring Canopy collection. The popular canopy with its variable attachment height of 180 to 330 cm only changes its name to Canopy M. In addition, there are now also the variations Canopy L and Canopy XL, which come with sides that are fixed at the ground. These sides also have triangular windows to give you a good look at the bad weather that won't get to you. 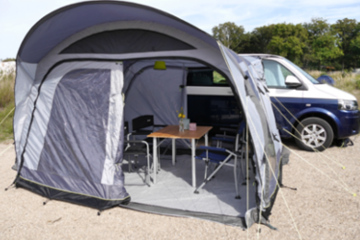 The awning Canopy M can be connected to all camping busses, caravans and other vehicles with a keder profile at 180 to 330 cm height. 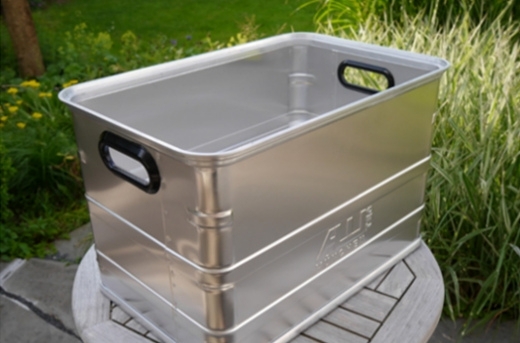 For the Canopy L, it's a little different: The attachment height needs to be 180 to 240 cm. Canopy XL is only suitable for higher vehicles: The required attachment height is 240 to 300 cm. As a result, Canopy XL has more headroom, even at the front bow it's 220 cm high, 10 cm higher than Canopy M and Canopy L. The width is bigger, too: Canopy XL is 350 cm wide, Canopy L and M are 320 cm wide. Do you have any questions regarding the drive-away awnings by Outwell? Please get in touch! We are here to help.